When I first retired from teaching in June, 2010, I was relieved to no longer plan lessons, assess a student’s progress or wait for a bell to ring so I could use the bathroom. I really thought it would be easy to quit work, easy like instant oatmeal. In the past two decades several of my personal essays had been published in magazines and newspapers including Woman’s World Magazine and the Washington Post, and I thought I would slip into a cozy routine to complete a bestselling novel or revise the play I knew would bring me fame and fortune. Then the reality of just how much time I had to fill amazed me. I felt an overwhelming lack of ambition. The loveliest two words in the English language– no agenda— suddenly felt daunting. I had no lesson plan. I moved to the state of Delaware, a mere three hours from Maryland yet away from friends and family. I missed meeting co-workers and girlfriends for happy hour or lunch. When I took my first class at the YMCA, I felt like a third grader at recess smiling at the woman next to me wondering, “Will she be my friend?” I missed my custom made curtains in the family room, my fireplace hearth, the perennial garden I created and even the flagstone patio leading up to the front door where my dog Rudi faithfully slept for 15 years. So together, we retreated to a new home near the ocean. I have now spent the last four years experimenting with a variety of activities. I wove baskets, failed at watercolor class miserably, volunteered at thrift stores, helped mentally challenged adults, joined a church, and discovered yoga. I also joined several book clubs and traveled abroad. I became a member of local organizations such as the Coastal Georgetown AAUW, The Rehoboth Beach Writers Guild, the Friends of Cape Henlopen State Park and the Lewes Historical Society. Gradually, I have let go of several activities or have relegated them to once a month and have kept active doing things which give me pleasure or a sense of well-being and purpose. I saw an ad for an essay contest in a magazine I subscribed to called Beach Life Magazine. I wrote about adjusting to retirement and my essay “Getting My Feet Wet” was the first place winner published in the April 2012 issue of the Beach Life Magazine. That essay gave me an idea! I couldn’t be the only person who was feeling confused about adjusting to retirement. Maybe others could share their journey with me? So I pitched the idea to a local paper for a column titled Retirement 101 in the Cape Gazette which debuted in the fall of 2012. And I love writing this column! And since it comes out every two weeks on Fridays, I have time to balance play and work. I have published new essays in the Washington Post (March, 2011) and in Delaware Beach Life Magazine (October, 2013) and am teaching multiple writing workshops through the RBWG and Del-tech College. Yet I feel victorious to welcome a day with no agenda—see that the birdfeeder needs refilling, think about phoning a friend, or become inspired to take a walk on the boardwalk. Sadly, our dear 16 year old Rudi died in my arms in May, 2013, after graciously accepting a new porch. She found moles to sniff out in lieu of chasing chipmunks and enjoyed short walks around her new neighborhood. In 2014, my husband and I adopted a 5 week old puppy named Gracie who is now 12 weeks old. 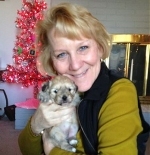 Gracie is a Lhasa Apso, Bichon, poodle mix and will grow to be a staggering 10 pounds. Everyone warned me not to get a puppy—‘Do you have any idea how much work they can be?’ I remember being a new mother for the first time. Of course it was hard work but there was joy in holding her tiny hands, in watching her take a step, and in the love returned to me as she learned to navigate a new universe for the first time. I learned how to be a parent and made my share of mistakes, but I would never have wanted to miss the experience. So like my own two children, Gracie has found a home in my heart. She is the cutest puppy ever, but she thinks she can boss us around, so I am reading books about puppy training and learning to be the alpha. Cribs are like crates—time outs are critical to everyone’s well-being! My puppy is teaching me about retirement. I can relish new beginnings like she discovers new smells. We both have time to explore new things. We can play and nap when we get tired. How fortunate are we? I lost my dog, Ginger after 16 years, and even worse on my 50th Birthday. I vowed , never again. Until the day I met Lucy. Lucy is a Bichon, poodle, 4 years old, and very sweet! She was so quite, and sleeping a lot , not at all like a poodle, jumping and hyper. I had her for 3 weeks, one night I went to see where she was, I heard strange noises coming from my closet. Upon opening it, there was Lucy, looking so scared, with two little puppies. She was frantic! She could not get the cord from around the one little puppy, and could not free him. So, never doing this before I was frantic as well! I cut the cord, and freed him. Lucy licked my hand, and let me clean her and new home all nice for her and her new babies. They were beautiful, and funny, had little personalities, Gracie, was for sure the Boss! I fell in love with both of these sweeties, but was grateful to find them such loving homes, and was happy to finally get to spend time with the real, not so pregnant Lucy. She is spunky, lovable, sweet, and we have a bond forever. Each family came to pick up there puppies right before Christmas. Lucy is a special doggie, who gave us a most wonderful gift, the gift of life.